Gosaikunda, also spelled Gosainkunda and Gosain Kunda is an alpine freshwater oligotrophic lake in Nepal Langtang National Park, located at an altitude of 4,380 m (14,370 ft) in the Rasuwa District with a surface of 13.8 ha (34 acres).Together with associated lakes, the Gosaikunda Lake complex is 1,030 ha (4.0 sq mi) in size and has been designated a Ramsar site in September 2007. 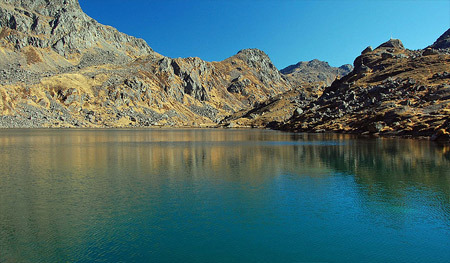 The popular start to the trek to Gosaikunda is in Dhunche Village or Syabru Besi both from the Langtang side. 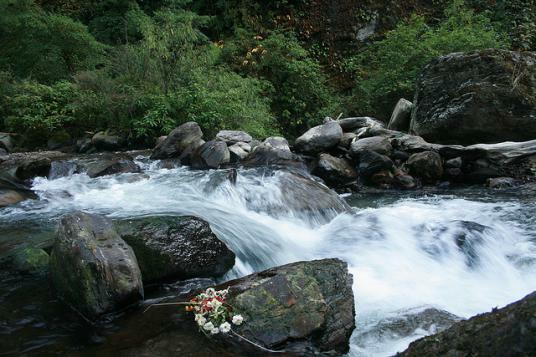 Alternatively, trekkers may also start from Sundarijal, which lies on the outskirts of Kathmandu. If you are starting from Dhunche, the first day involves a long steady climb to reach Chandan Bari, which is at a height of about 3200 meters. On the second day, one reaches Laurebinayak at about 3700 meters. At this point, some trekkers choose to climb ahead to Gosaikund, though altitude sickness is a concern due to rapid ascent. Many trekkers choose to stay at Laurebinayak which also provides excellent sunset and sunrise views of the Langtang and Ganesh Himal. 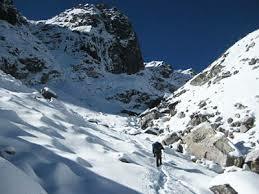 The descent from Gosaikund to Sundarijal takes about four days. The first day involves a short climb to Laurebina pass (4600 metres) and a rapid descent to Phedi or Ghopte. Depending on pace, there are options to stay at Tharepati, Mangengoth, Kutumsang and afterwards at many village habitations every two hours. Accommodation is quite easily available, though basic and a variety of food options are also available at tea house stops. The trails are very well marked, except between Ghopte and Thorepati, where chances of losing ones way are real. Day 03: Shyabrubensi to Lama Hotel (2804 m). Day 04: Lama Hotel to Langtang Valley (3500 m). Day 05: Langtang to Kyanjin Gompa (3800 m). Day 06-08: Acclimatize at kanjin gompa. Day 09: kanjin to Ngegang. Day 10: Ngegang to Keldang. Day 11: Keldang to Dukpu. Day 12: Dukpu to Tarke Ghyang. Day 13: Ghyang to Shyarmathang. Day 17: Departure to International airport. Day 09: Thulo Syabru to Sing Gompa (3254 m). Day 10: Sing Gompa to Gosainkund (4300 m). Day 12: Gosainkunda to Therapati (3600 m). Day 13: Therapati to Gul Bhanjyang (2130 m). Day 15: Chisopani to sandarijal 2 hour Trek and drive back to Kathmandu. O/N Hotel. Day 16: Departure to international airport Or Other appointment.